Karin Weber Gallery is excited to present a new gallery collaboration with a Hong Kong and a Macau artist in the upcoming show ‘Paperscapes’: New Works by Wong Chun Hei Stephen and Eric Fok. Paper transforms into the perfect backdrop for the artists’ flights of the imagination across mythical mountain – and cityscapes. ‘Paperscapes’ created by both artists may be surreal, yet elements that appear warmly familiar to the viewer appear in each work. An intriguing blend of the local, the rooted, and the everyday are juxtaposed with the dreamy and fantastical in works inspired by the past, yet inspired by the minds of their creators. The fantastical nature of the show is enhanced by the miniature sizing of many of the paintings, introducing greater complexity while demanding even greater craftsmanship. 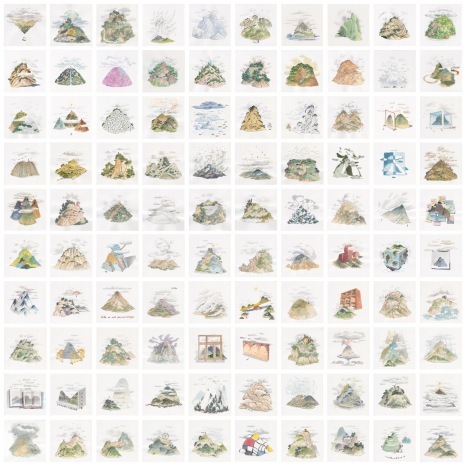 Stephen Wong’s miniscule mythical mountains appear in myriad numbers, and are abuzz with their own curious, quirky energy. Presented in groups of up to one hundred (each mountain painting measures only 12x12cm), they draw inspiration from classic Chinese art practices – such as landscape painting or blue and white porcelain – as much as Hong Kong urban, everyday life. Trees, birds and eggs meet calligraphy, planes and cargo ships on Wong’s mountains, frequently devoid of human presence, yet with a distinctly human feel to them. At first glance, Eric Fok’s Hong Kong cityscapes are steeped in history. 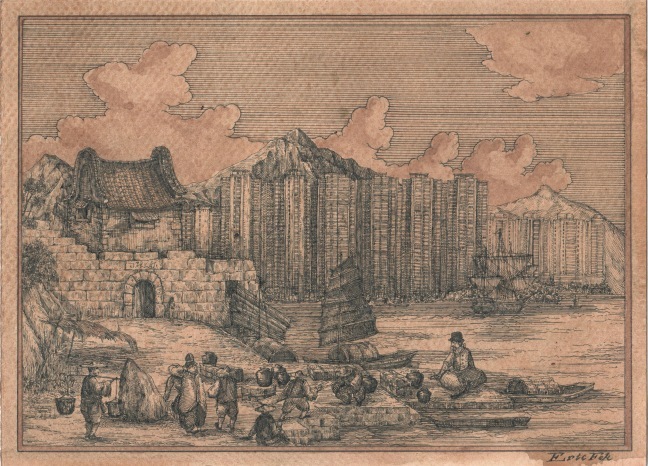 The artist’s engagement with 16th and 17th century mapmaking permeates every piece – paper is pre-treated with tea and acrylic to create an antique effect, a fictitious owner’s coat of arms appears, and ‘old world’ galleons share the water with mythical sea creatures, while servants carry trade goods through ancient landscapes. Closer exploration of each work, however, reveals distinctly recent Hong Kong landmarks that are signifiers of a far more contemporary cityscape. Galleons meet Star Ferry boats and Chinese pavilions share space with the IFC and Bank of China buildings, while ancient sea beasts may encounter Umbrella Revolutionaries perched on a nearby bridge. ‘Paperscapes’ by Wong and Fok bring complex, surreal worlds to life. Whilst they encourage a reading as a reflection of the daily influences that shape our individual realities, they offer, first and foremost, an enticing gateway into the curious, fantastical minds of their creators. Courtesy of the artists and Karin Weber Gallery, for further information please visit www.karinwebergallery.com.